VIM, a regional leader in display solutions, has provided the LED screen technology for StarFM Radio and installed at KidZania, a Mexican chain of family entertainment centers, located at Dubai mall, world’s largest shopping mall located under Burj Khalifa in Dubai. 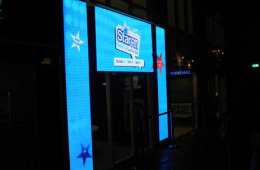 StarFM Radio uses Visual Interactive Media creative LED solution to light up KidZania in The Dubai Mall. The screen located at the entrance of the entertainment center and families’ destination, will be displaying videos and colorful animation for StarFM; the leading radio station, part of Abu Dhabi Media Company based in Abu Dhabi. StarFM was looking for a dynamic display that can capture the audience attention through creativity, and should have the capability of displaying unlimited number of visuals and messages to the targeted audience, and this is where VIM came into the picture with their designing team and engineers who studied these need and proposed the perfect solution; VIM will be also developing the creative messages and videos played on the screen. “Our friends at VIM hadn’t only provided us with an extra ordinary visual experience, but they supplied us as well with the confidence that this bold project will be seamlessly implemented as they presented the visual content displayed on the screen too,” says Bassam Kaedbey, Head of Marketing / Radio at Abu Dhabi Media Company. “The unusual position as an up-side-down screen structured as 3 different screens has been considered a challenge as the control solution has to be flexible in offering designers the desired freedom to design its screen contents,” Mr. Houssam Boutary UAE Country Manager for VIM said.